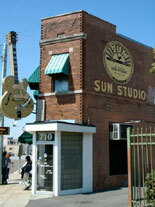 Come discover and experience the Memphis Sun Studio Tour in all it’s musical and historical grandeur. It is located at 706 Union Ave at Marshall St. which is in downtown Memphis, Tennessee. There you will be able to step back in time and walk in the footsteps of some of the greatest musical icons of American music. Come see where they got their running start, musical geniuses such as Elvis Presley, Johnny Cash, Carl Perkins, Roy Orbison, B.B. King, and Jerry Lee Lewis just to get started. Come and taste the flavor of the rich history of Memphis music and how it has touched American culture, and even the whole world. Step into the studio and re-experience the birth of rock and roll music right here in Memphis. This legendary tour runs conveniently every single day of the week from 10:00 am to 6:00 pm. The daily tours start at the middle of every hour and take about 45 minutes to complete. There’s no need to make reservations because they aren’t required for this casual tour. After you’ve enjoyed this fascinating tour, don’t forget to take a few minutes to hang back in the 50’s atmosphere at the one of a kind Sun Studio Soda Shop and Record Store. After your tour you can relax there and have a snack or soda and purchase some memorabilia before you go on your way.